A disturbing YouTube video showing a young woman throwing puppies into a river has sparked cries of outrage among Internet users with many vowing to hunt her down. The video was originally uploaded to the video sharing sites YouTube and LiveLeak earlier this week, and quickly taken down by both sites. Since then the video has gone viral, and been posted to copious sites (including LiveLeak) in an attempt to catch the puppy-abuser. I'm not going to embed the video here because the video is too disturbing for my tastes and it can be found elsewhere on the Internet easily. The video shows a blonde-haired girl picking up puppies out of a bucket and tossing them into a river. At this time, it's unclear if the video is authentic or a hoax. The People for the Ethical Treatment of Animals (PETA) has also jumped into the fray--on Tuesday, it offered a $2,000 reward for information that will lead to the arrest and conviction of the person or persons involved in this incident of animal cruelty. That said, the Internet has wasted no time in getting to work hunting the girl (and the camera man) down. 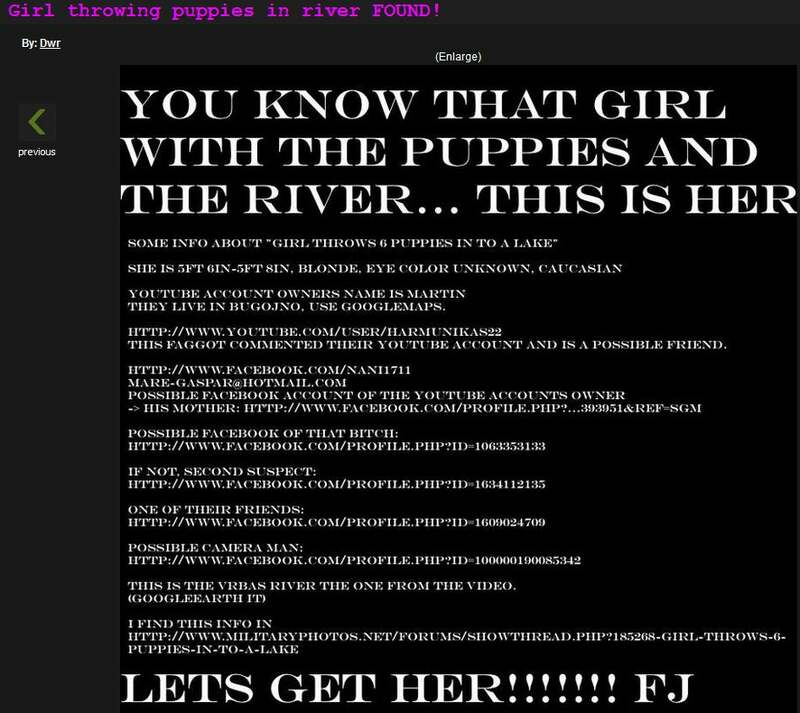 Web users on the popular Internet forum known as 4chan immediately jumped to identify the girl--and if there's one thing 4chan is good at, it's finding people who abuse animals. It appears that they've already identified the owner of the YouTube account to which the video was first uploaded (the user's name is Martin, and he appears to be from Bugojno, Bosnia), as well as a couple of Facebook accounts that may or may not belong to the girl. The board also thinks it has identified some of the girl's friends, and has posted all this information to an image board. Nobody has come forth to admit guilt yet, but that hasn't stopped the forum from harassing who it assumes to be the guilty parties. While Internet vigilantism--4chan especially--often does more harm than good, the /b/ board has helped to catch animal abusers before. Image on the right is courtesy of the UK publication The Independent. It shows Bale being escorted by police to her front door to protect her after she receive death threats from Internet users. In February 2009, a teenage boy uploaded a video of himself and another boy abusing a cat named Dusty. 4chan users saw the video and immediately began piecing together information about the boy using social networking sites and clues (such as the boy's bedroom, which was briefly seen in the background) from the video to identify the boy as Oklahoman teen. 4chan alerted the local authorities and both boys were arrested. The cat was still alive and was treated by a vet. Just a few days ago, 4chan helped track down an alleged animal abuser--45-year-old Mary Bale of Coventry, England. Video from a security camera uploaded to YouTube less than a week ago depicted an older woman petting a gray cat and then tossing it into a garbage can (with a lid). The cat was found 15 hours later, still alive. 4chan users jumped on this case and managed to find Bale's employer, address, social networking profiles, and harassed her until she went into hiding.